I’m not a fan of the International Monetary Fund. The bureaucracy was created in 1944 to manage and coordinate the system of fixed exchange rates created as part of the 1944 Bretton Woods agreement. But once fixed exchange rates disappeared, the over-funded bureaucracy cleverly adopted a new rationale for its existence and its main role now is to bail out insolvent nations (what that really means, of course, is that it exists to bail out big banks that foolishly lend money to profligate third-world governments). As part of this new mission, the IMF acts like the Pied Piper of tax hikes. The bureaucrats parachute into nations, refinance and restructure the debt of those countries, and insist on a bunch of tax increases in hopes that more revenue will then be available to service the new debt. Needless to say, this is not exactly a recipe for growth and prosperity. The private sector in these countries gets hammered with tax increases, the big banks in rich nations get indirect bailouts, and the real problem of bloated government generally is left to fester and metastasize. 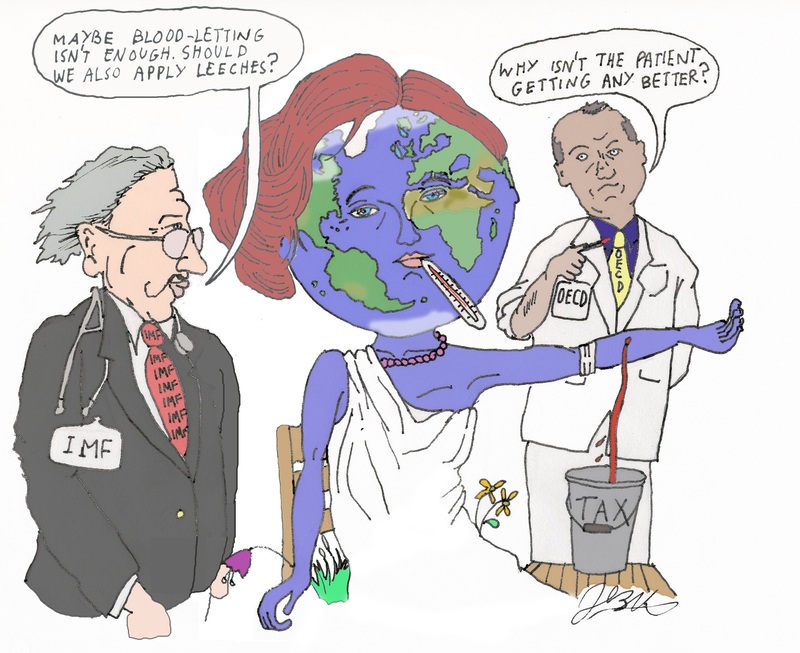 This is why I’ve referred to the IMF as the Dr. Kevorkian of the global economy. But the bureaucracy is bad for other reasons. It also has decided that it should grade all nations on their economic policies and it routinely uses that self-assigned authority to recommend big tax hikes all over the world. Including lots of tax increases in the United States. The IMF even tries to interfere with American elections. Just recently, the chief bureaucrat of the organization launched a not-too-subtle attack on Donald Trump. Though in this case, which involved trade barriers, the IMF actually is on the right side (the bureaucracy generally has a pro-tax bias, but the one big exception is that it favors lower taxes on global trade). Anyhow, the IMF’s Managing Director warned that additional protectionist taxes on global trade threaten the global economy. And even though she didn’t specifically mention the Republican nominee, you can see from the various headlines I’m sharing that reporters put 2 + 2 together and realized that Ms Lagarde was criticizing Trump. And he deserves condemnation. The post-World War II shift to lower trade taxes has been a big victory for economic freedom (indeed, tariff reductions have helped offset the damage caused by increasingly bad fiscal policy over the past several decades). Nonetheless, there is something quite unseemly about an international bureaucracy taking sides in an American election (who do they think they are, the IRS?). Especially since American taxpayers underwrite the biggest share of the IMF’s activities. Let’s look specifically at an analysis of the IMF’s actions from the UK-based Guardian. By the way, while I agree with her comments on trade, her comments about a “barrier along the border with Mexico” reek of hypocrisy. Christine Lagarde criticises his policies including plans for…a US-Mexico border wall. Those who have visited the IMF’s lavish headquarters can confirm that there is a very heavily guarded barrier separating the IMF from the hoi polloi and peasantry of Washington. Call me crazy, but a bureaucracy with lots of security to prevent unauthorized people from entering its building is in no position to lecture a nation for wanting security to prevent unauthorized people from crossing its borders. And I say this as someone who generally favors immigration. But let’s set that issue aside. There’s actually a very serious sin of omission in the IMF’s analysis that needs to be addressed. The international bureaucracy (correctly) opposes trade taxes and wants to build on the progress of recent decades by further reducing government-imposed barriers to cross-border economic activity. As noted above, this is the right position and I applaud the IMF’s defense of lower tariffs and expanded trade. That being said, the level of protectionism has fallen significantly in the post-World War II era. In other words, trade taxes already are reasonably low. Yes, it would be better if they were even lower (ideally zero, like in Hong Kong). My problem (or, to be more accurate, one of my problems) with the IMF is that the bureaucracy acts as if the world economy is hanging in the balance if there’s some sort of increase in the currently low tax burden on trade. Yet what about the tax burden on behaviors that actually generate the income people use to purchase goods from other nations? Top tax rates on personal income average more than 40 percent in the developed world, dwarfing the average tariffs of trade. And the burden on income that is saved and invested is even higher because of double taxation, which is especially destructive since all economic theories – including Marxism and socialism – agree that capital formation is a key to long-run growth and higher living standards (i.e., the ability to buy more goods, including those produced in other nations). So here’s the question that must be asked: If it is bad to have very modest taxes on the share of people’s income that is used to buy goods produced in other nations, then why isn’t it even worse to have very onerous taxes on the productive behaviors that generate that income? In other words, if the IMF is correct (and it is) to criticize Trump for threatening to increase the modest tax rates that are imposed on global trade, then why doesn’t the IMF criticize Hillary Clinton for threatening to increase the rather harsh tax rates that are imposed on working, saving, and investment? Maybe Madame Lagarde’s army of flunkies and servants (one of the many perks she gets, in addition to a munificent tax-free salary) can explain that sauce for a goose is also sauce for a gander. By the way, I can’t resist addressing one final aspect to this story. The Guardian‘s report notes that Lagarde wants to offset the supposedly harmful impact of trade by further increasing the size and scope of government. …the solution was for governments to provide direct financial support for those with low skills through higher minimum wages, more generous welfare states, investment in education and a crackdown on tax evasion. Wow, that’s a lot of economic illiteracy packed into one sentence fragment. Does she really think low-skilled people are helped by minimum-wage mandates that destroy jobs and economic opportunity? Does she really think low-skilled people are better off if they’re trapped into welfare dependency? Does she really think that government monopoly school systems will actually get better results with more funding? Does she really think a “crackdown” rather than lower tax rates is the best way of obtaining better compliance? Now you understand why I refer to the IMF as the dumpster fire of global economics. P.S. While the IMF likes to push bad policy for the United States, the bureaucracy’s proposals for China are akin to a declaration of economic warfare. P.P.S. The IMF’s flip-flop on infrastructure spending reveals a lot about the bureaucracy’s inner workings. P.P.P.S. While the IMF often produces sloppy and dishonest research, every so often the professional economists on the staff slip something useful past the political types. Though my all-time-favorite bit of IMF research was the study that inadvertently showed why a value-added tax is so dangerous. The pathway to smaller government is to cut the number of bureaucrats first. Savings on spending will follow. “A bureaucrat here, managing a public program, and bureaucrat there, managing another, and pretty soon you are talking about s real bureaucracy managing the whole government command economy.” Can’t pinpoint the source, but it sounds like a Sen. Dirksen(? )…or maybe a pragmatic libertarian observer like Mitchell(?). Mr. Veritas, if you had a choice of two grocery stores that offered the exact same products, but one had prices that were 10% lower than the other, which store would you patronize? And the 10% that you save, does that disappear from the economy? Of course not. You are now free to use that 10% for other things. What if the store with the lower prices was in the next county and you still saved 10% including your transportation and convenience costs? A prudent man would still buy from the less expensive grocer. Does your county’s economy lose out because of this? At first glance, it might appear to, but remember you just saved 10% – in other words, you just became 10% more productive on your grocery purchases. How can that be bad? As Adam Smith said, “What is prudence in the conduct of every private family can scarce be folly in that of a great [nation]”. National boundaries do not change the above. I am tired of hearing about free trade when all I see is various forms of protectionism. How has America profitted from this global free trade? In 1981 there were 6 auto factories in Mexico, todaty there are over fifty-all US. Ford announced a 1.6 billion plant to be built there. Government regulations, unions, and idiot Wall Street have destroyed manufacturing in the USA. But do not tell me that free trade as defined by the IMF or any other government agency is the answer.